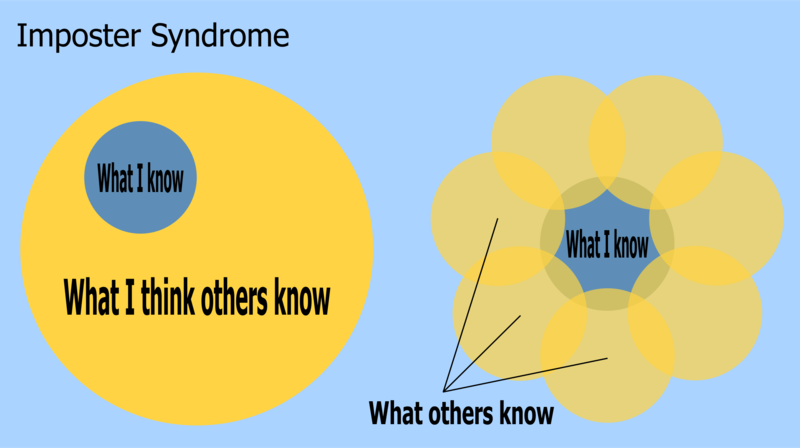 Impostor Syndrome, or feelings of self-doubt, is a common occurrence in just about every field and career. Software developers might experience it more frequently due to the constant and rapid changes in technology we are faced with, but we are not alone. Doctors, professors, attorneys, actors, authors, movie producers, and many, many more all at one time or another seem to suffer from self-doubt or Impostor Syndrome. Tom Hanks has Impostor Syndrome? Tom Hanks, for example, has had a rather impressive acting career by most standards. With movies like Apollo 13 , Sleepless in Seattle , and Saving Private Ryan . Five Academy Award nominations with two wins, eight Golden Globe Award nominations with four wins, in fact, he has accumulated 17 major award wins in his career. Over a 50% “win” ratio. I’m not an expert on acting award ratios, but winning more often than losing has to be a good standard. Clearly, if Mr. Hanks has doubts about his acting abilities in comparison to others, we shouldn’t be shocked when we encounter feelings of being an impostor in our own roles. I would venture to guess that we have all had people we look up to in our jobs or industry. People that we believe have knowledge, experience, or talent that we will never be able to achieve. Remember back to when you were first starting out in your current career. I know, for some that is much more recent than others, but think back. Recall a time when you were watching your mentor fly through some project code or teach a difficult subject. Did you feel like “Wow, Trina is amazing! I’ll never be as good as her?” Or maybe you were struggling on a project and after hours of trying to figure out a solution Travis walks by, points out your mistake and just walks away shaking his head after spending seconds on the project? Both scenarios start that feeling of self-doubt. That feeling of being an impostor in our chosen field. That feeling that someone is going to find out that we are frauds and should be doing something different. But how can we combat that feeling? How can we prevent it from taking over our thoughts and stifling our work flow and creativity? I like to think of combating impostor syndrome in a metaphorical way of a knight fighting a dragon. Prior to going off to battle the dragon that is Impostor Syndrome we need to get our mental armor on. 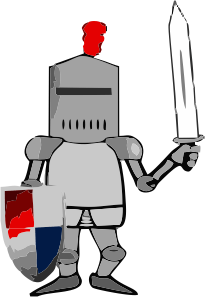 As with a suit of armor and tools that a knight would wear and use, we need to put on mental armor when we start on a new task or project to prevent our struggles with learning from overwhelming us. Things like a helmet, breast plate, leggings, boots, sword, and shield are all needed to fight our evil dragon. I think of the helmet as protecting bad thoughts from entering and good thoughts from exiting my brain. We all have knowledge and skills to bring to the table, it is often a matter of being humble enough to admit that we do know things and restructure what we think others know. As we can see, we do know things about our tasks, and how to implement them. Keeping our thoughts protected can help us remember that. Our breast plate (which will for the sake of argument include arm and hand protection) I think of as protecting us from negative feedback. Let’s face it, not everyone is as nice or tolerant of others as we would like. Often when we are working with someone who we highly respect in our careers, they can do or say something that enhances our impostor feelings. “How long have you been staring at that code, Joe? Of course, it isn’t working, that line isn’t indented correctly. Duh!” Huge blow when that happens to us, right? Keeping a breast plate on us to allow those comments to not have as large of an impact is important to prevent the impostor dragon from causing overwhelming damage. The leggings are important as well. Obviously without our legs walking, running, and moving about to engage in combat would be a challenge. To combat our dragon we need to engage in community, realize that we are not alone in feeling like an impostor. Everyone has something to contribute to a project, and to the battle to fight our dragon. Boots, or in the language of armor sabatons, protect our feet, which we need to make steps along our journey. Keep a journal of the steps we take as we walk along our journey. Write down successes and, yes, failures. It provides retrospective insights about both conditions and revisiting them allows us to remember both equally as well. Thus far everything has been something we would actually wear. A shield is something we carry with us, right? In this metaphor, a shield represents an idea to shield us. That idea is that knowing that no one is perfect. No one. There is no perfect actor, doctor, author, professors, and there certainly isn’t a perfect developer. Knowing that even the most seasoned developer on your team likely suffers from impostor syndrome from time to time as well will help shield you from your own thoughts of being an impostor and will help fight off that evil dragon. These are the basics of our armor: a helmet to protect our thoughts, a breast plate to protect us from negative feedback, leggings to remember that we are not alone out there, boots as a reminder to keep a log of our journey, and a shield to protect against the idea that the perfect developer exists. Now we get to our weapon, the sword. Imagine going into battle against a dragon without an offense? Our sword is used to represent knowledge. That is what ultimately will slay our dragon, right? When we feel confident in a certain task, we no longer feel like an impostor in that one area. Remember that even the most experienced people continue to fight and search for answers and gain knowledge in the process. With our armor, shield, and sword set and ready to fight our dragon, we should likely have a battle plan. Fortunately, if we keep our protection in place it simplifies our battle quite considerably. For new developers (and by “new” I am talking not only about new to the industry, but also new to a given subject or technology), remember that everyone in a development role is in a constant learning state. Find a good mentor as part of your game plan, it will help in sharpening your sword (knowledge) to fight our dragon. If you are a seasoned developer, you can help in our battle plan as well. While you might not be struggling with writing a “Hello world” app in Java 7, remember that there are things to learn in Java 9 that might cause you to resharpen your sword. Use your experience to mentor junior developers and put yourself in their shoes. Remember what it was like to push your first repo to GitHub, to make your first pull request to an Open Source library, or your first venture into using a new Python library. Let’s all try to keep our helmet, breast plate, leggings, boots, and shields in tact to protect ourselves during those times in which we are facing our dragon named Impostor Syndrome. And keep up on our learning and mentoring as well, to keep our sword sharp to battle and defeat the dragon.